Obit Steve Gold, a former hacker who became a respected information security journalist, has died following complications from heart surgery. 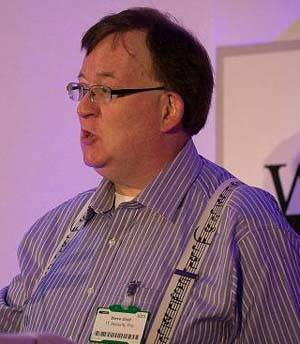 Tributes to Gold from the tight-knit UK security and publishing communities have been pouring in following his death, aged 58. Gold unwittingly became famous in the mid '80s when he collaborated with fellow journalist Robert Schifreen to hack BT's Prestel viewdata service, famously accessing the personal message box of Prince Philip in the process. Schifreen explained: "I came across a Prestel test ID by accident (was testing a modem and just typed random numbers, basically). That got me into a BT internal Prestel page containing the phone numbers of the dev mainframes. "After I'd tried those for ages, one day someone left the system manager credentials on the login page of the dev mainframe. So I phoned Steve (who'd been pursuing Prestel in other ways). I then went and told Micronet what I'd done, and they told Prestel... who called in the Met." The duo were subsequently arrested and convicted for offences under the Forgery & Counterfeiting Act but the verdict was successfully overturned on appeal. "The prosecution case was that typing someone's password into a computer in order that the computer can check whether it's correct or not, is the same as writing their signature on a cheque," Schifreen told El Reg. "The Lords decided that there's a difference between a short, transient episode and something more permanent, and threw it out. Or rather, the High Court threw it out, then the prosecution went to the Lords, who threw it out again. I always like to say that Steve and I won 2-1 on aggregate." The case revealed gaps in the law and led to the introduction of the 1990 Computer Misuse Act, the UK's first computer hacking law. "He was part of my life (in a very weird way!) for a long time, and I'll miss him loads," Schifreen said. "We always used to meet up at Infosec every year. Later this year is the 30th anniversary of our arrest, and I never imagined for a moment that we wouldn't both be around to commemorate it in some way." Gold went on to write about the case and collaborate as an author with Professor Peter Sommer in writing the Hackers' Handbook. He also edited and contributed to numerous technology publications as well as co-founding SC Magazine as well as contributing as a speaker at technology conferences. Gold even presented at conferences alongside the police officers who arrested him. "So sad to hear that Steve Gold has died," said Rik Ferguson ‏of Trend Micro, summing up the thoughts of many. "A real gent, sharp, incisive but jovial and trustworthy. A great loss." Gold was a technology enthusiast who started his career as a nurse before becoming rising to become senior internal auditor/fraud investigator in the National Health Service – before becoming a full time journalist and editor in the mid-'90s, a career distinguished by his good humour and deep knowledge. He wrote mainly about communications and information security. At the time of his death, Gold was group editor for LGN Media, which publishes Cloud Computing World, Lawtech Magazine and Netcomms Europe. Ian Titchener, managing director of LGN Media, said "Steve had been very poorly in the run-up to Christmas, and sadly we were informed this morning that he passed away during the early hours of today. "Our thoughts and prayers are with Steve's family. We will be preparing a tribute to Steve for the forthcoming issue of Cloud Computing World," he added. An additional tribute by SC mag can be found here.